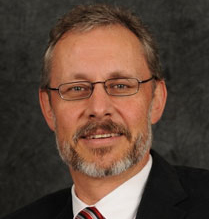 Cornelis (Neels) Van der Schyf was appointed Vice President for Research at ISU in March 2015. He assumed a dual position as VPR and Dean of the Graduate School. Van der Schyf earned his BPharm, MSc, DSc (PhD), and DTE degrees from North-West University in South Africa, and spent 1986-7 as a postdoctoral fellow in the Department of Medicinal Chemistry at the University of Connecticut and at the National Magnet Lab at MIT, Cambridge, MA.